Burlap and lace wedding invitations are a dream come true for your wedding theme! 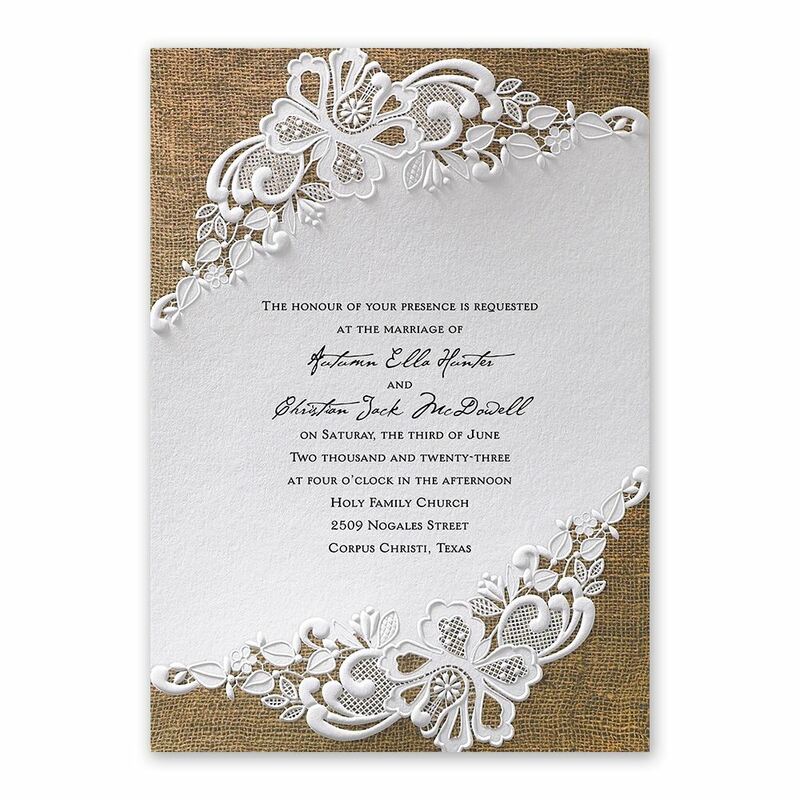 These beautifully designed lacy dream wedding invitations feature embossed lace details and a white backdrop for your wording. A burlap patterned background adds a rustic element to the ensemble. Your wording is printed in your choice of colors and fonts. Inner and outer envelopes are included. This product features thermography printing. Thermography is a unique printing technique that results in raised lettering you can feel, which adds to the luxurious experience of this printed piece. This invitation was exactly what we were looking for! The elegant lace with the rustic background was the perfect combination of the style we wanted. I love that the lace is textured and complements the burlap background. The quality is great for the price you buy it for. It's nice and thick so its very sturdy. I ordered 108 and had plenty left over since they put in a few extras for mess-ups. Would recommend this product to anyone who is looking for an elegant but rustic style for their wedding. They are gorgeous! Really well made- We loved the way the lace and letters were textured! I love my wedding invitations! My theme is a combination of vintage and rustic with an elegant edge (it works, really!). This style invitation is perfect for the theme. I love that the lace is embossed and the photo burlap is realistic. The online software made it easy to customize our invitations. I worded the first line, "Celebrate With Us The Joy Of Our Wedding" and was able to add a lovely script to our (bride and groom) names. I highly recommend this style! Everything I was expecting and more. Just perfect. I ordered these invitations for my wedding and I was amazed at how beautiful they were. I love how the white design & letters on the invitation added texture to the invitation. It doesnt feel like an invitation that was printed soley from a printer. 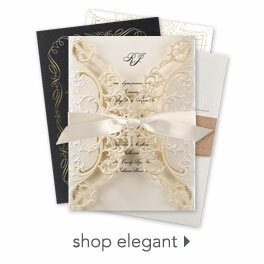 This invitation was worth every penny & I would highly recommend this invitation style. The invitations were beautiful and exactly what I was looking for. The only down fall to these were I got a lot of backlash for the grooms family because the Bride's name was in larger font then the grooms and it made for a very upset bride when she was being accused of belittling the groom. Other then that I loved the product. Thanks!